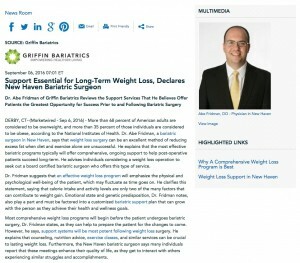 Dr. Abe Fridman of Griffin Bariatrics reviews the support services that he believes offer patients the greatest opportunity for success prior to and following bariatric surgery. 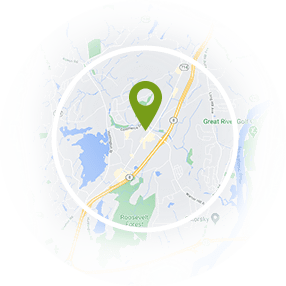 Derby, CT — More than 68 percent of American adults are considered to be overweight, and more than 35 percent of those individuals are considered to be obese, according to the National Institutes of Health. Dr. Abe Fridman, a bariatric surgeon in New Haven, says that weight loss surgery can be an excellent method of reducing excess fat when diet and exercise alone are unsuccessful. He explains that the most effective bariatric programs typically will offer comprehensive, ongoing support to help post-operative patients succeed long-term. He advises individuals considering a weight loss operation to seek out a board certified bariatric surgeon who offers this type of service. Dr. Fridman suggests that an effective weight loss program will emphasize the physical and psychological well-being of the patient, which may fluctuate as time goes on. He clarifies this statement, saying that calorie intake and activity levels are only two of the many factors that can contribute to weight gain. Emotional state and genetic predisposition, Dr. Fridman notes, also play a part and must be factored into a customized bariatric support plan that can grow with the person as they achieve their health and wellness goals. Most comprehensive weight loss programs will begin before the patient undergoes bariatric surgery, Dr. Fridman states, as they can help to prepare the patient for the changes to come. However, he says, support systems will be most potent following weight loss surgery. He explains that counseling, nutrition advice, exercise classes, and similar services can be crucial to lasting weight loss. Furthermore, the New Haven bariatric surgeon says many individuals report that these meetings enhance their quality of life, as they get to interact with others experiencing similar struggles and accomplishments. Ultimately, Dr. Fridman believes that weight loss programs that take a comprehensive, whole-health approach typically offer patients better care in the short and long term. He says providing diverse support services can help individuals lose weight, improve their health, and maintain a sense of control in their lives. This combination, Dr. Fridman suggests, often will be “the secret” to lasting health and stable weight. The head physician at Griffin Bariatrics at Griffin Hospital, Dr. Abe Fridman is a Cornell educated surgeon who earned his medical degree from the New York College of Osteopathic Medicine. He completed additional medical training at North Shore-LIJ (now known as Northwell Health), SUNY Downstate Medical Center, and the Lutheran Medical Center in Brooklyn. Dr. Fridman also completed a Fellowship in Minimally Invasive Bariatric Surgery a the Cleveland Clinic in Florida. The recipient of numerous accolades, Dr. Fridman is also a member of the American Society of Metabolic and Bariatric Surgeons, the American College of Surgeons, and the American College of Osteopathic Surgeons. He is available for interview upon request. For more information about Dr. Fridman and his practice, please visit griffinhospitalbariatrics.com and facebook.com/griffin.bariatrics.